From time to time, knitters complain that their craft suffers from an image problem - that knitting is wrongly described as un-cool, old-fashioned, 'nana-ish' (a term I hate, but will save my critique for another entry), or, to use a wonderful old Australian term, daggy. 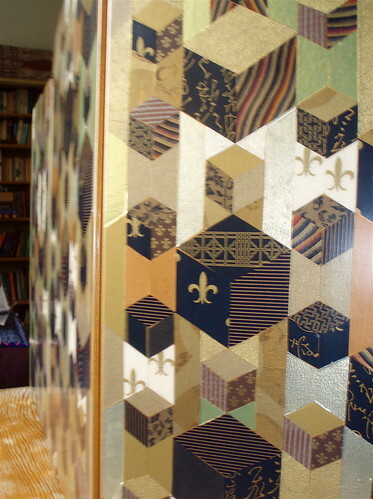 But in comparison with another crafting passion from my past - decoupage - knitting's image problem is negligible. I was a very committed decoupeur for many years, but I usually avoided telling people about my crafting passion, and was often embarrassed or defensive if others discovered this madness that filled my spare moments. I've recently started some decoupage again, in response to a special request from a friend, and I've been newly overwhelmed by the pleasure I get from this rather obsessive and extremely finicky craft. I love the designing stage, when you have to play with any idea you have to accommodate it to the shape you are decorating. 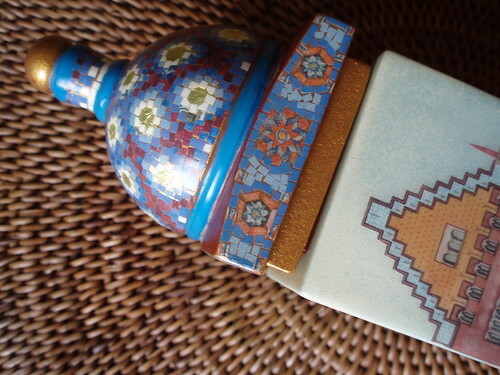 I enjoy the quest for the perfect found or created object to decorate. Of course I love choosing colours and searching for and choosing appropriate paper images. I like the care I need to take to cut-out the images (though this is sometimes frustrating as well) and the make-or-break moment when the images are glued to the prepared object. But what I most love is the weeks of finishing; coat after coat of fine varnish, sanded periodically, so that the images sink beneath the glowing surface. I've kept very few of the things I've made; only a couple with which I was particularly pleased. 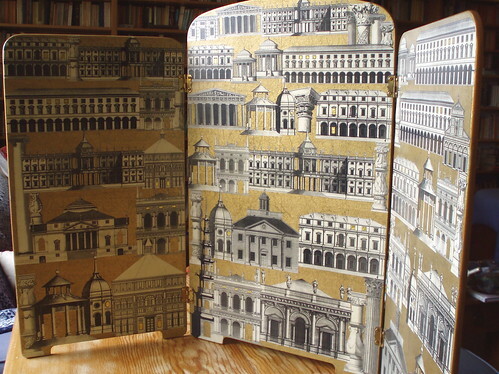 One is a small trifold screen (80 x 48cm) which I labelled 'After Fornasetti'. 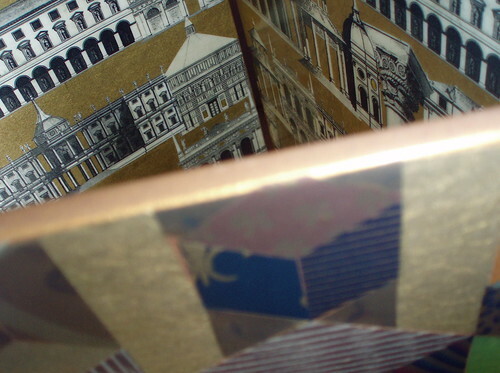 The black and white architectural design on one side is clearly influenced by the Italian designer, Fornasetti, and the other side is a traditional patchwork design in black and gold papers. I use the screen to hide some unsightly but necessary clutter that lives on top of a cupboard in one of the bedrooms. The other object I've kept is the 'Barcelona' box. 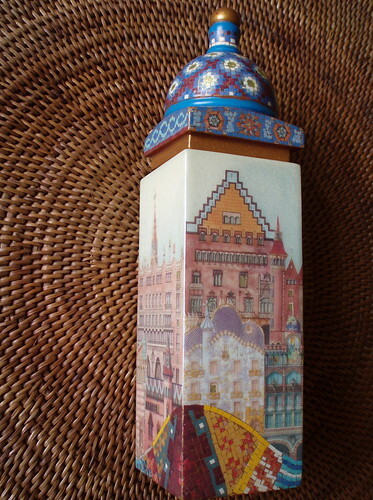 I found the box itself on sale in a gift shop in Manila, and after painting it, decorated it with a combination of pastel-coloured images of famous Barcelona Modernist buildings, and tiny scraps of paper used to imitate Gaudi mosaics - I had long been fascinated by the Gaudi mosaics in Parque Guell in Barcelona. The dimensions of the 'Barcelona' box are 19 x 5cm. It's an absolutely useless object, and mostly lives in a storage box. However, having unwrapped it to take these photos I'm newly delighted by it, so I'll put it somewhere I can see it from time to time. I think I'm deeply satisfied by both knitting and decoupage because they share the quality of making something beautiful from everyday materials, and because they both pose the challenge of being creative within well-established conventions and with repetitious skills. So, there you are. I'm a practitioner of not only one daggy craft, but two! Deeply un-cool. I have a jacket that was made for me by my old friend, Erika Semler. It must have been made around 1978 or so - there are photographs of me wearing it in 1980. 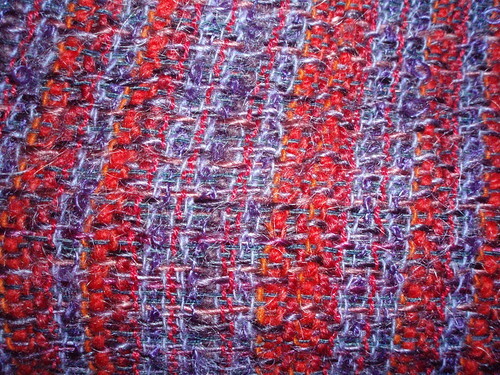 Erika wove the fabric for the jacket - a rich combination of reds and purples. 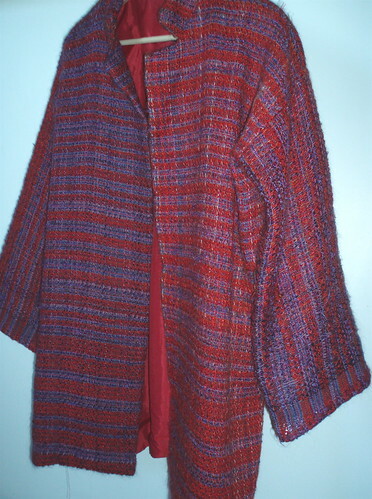 She also spun and dyed some of the yarns used within it, and designed and sewed the jacket. It's a simple shape that I love. Depending on my size and the fashion of the time, I've worn it clasped together with a brooch, or freely hanging. I think it was my first venture into asymmetry, as each of the front sides is differently coloured - one more purple; the other reddish. It's been much loved, and the lining is now tattered and needs replacing. I value the jacket greatly. 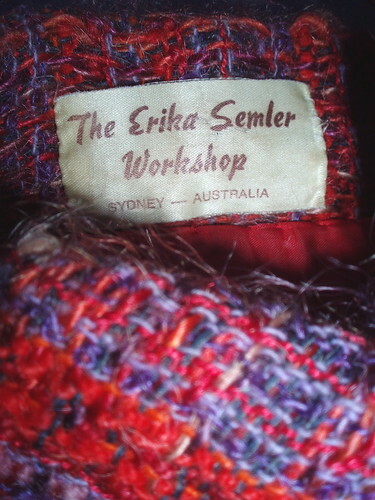 Erika Semler is an important figure in weaving in Australia, and crafting more generally. She trained as a Master Weaver in Germany and, as Erika Gretschel, emigrated to Australia to establish the professional weaving workshop at the Sturt Workshop in Mittagong in 1951. For most of her life Erika has taught weaving to generations of Australian weavers - most Australian weavers would have been influenced by Erika either directly, or through their teachers. Some of her work is held by the Powerhouse Museum in Sydney. She has done much to be treasured. Erika has the kind of pragmatic attitude to her craft that I imagine Elizabeth Zimmermann has. Nothing is impossible. She believes that craft, art and music are not for the select few, but within everybody's capabilities and vital for their full development. She cared for and valued the environment long before 'green' issues were broadly accepted, and experimented with using dyes derived from Australian plants to reflect nature in her work. She is an avid and adventurous traveller and has collected textiles from many corners of the world. Now well into her 80s she is still active - attending exhibitions and concerts, caring for her house and garden in the Blue Mountains, turning out for bushfire prevention training, and continuing to extend her endless hospitality. I wrote a couple of months ago about my addiction to crime fiction - an addiction I'm now aware is shared by quite a few of my fellow-knitters. At the time I wrote that my main motivation in reading crime fiction was escapism, and I think I'm having to face up to the fact that some of my other choices of reading matter stem from the same motive. I've long loved decorating magazines - an odd obsession for someone as chronically untidy as I am. But I've come to the conclusion that it's precisely because I am so incapable of maintaining order in my surroundings that I love decorating magazines. (A particular obsession for many years has been a UK magazine World of Interiors) These magazines provide me with images of an ordered world - or at least an artfully cluttered one - and give me an illusory hope that one day I'll inhabit a more ordered and elegant life. 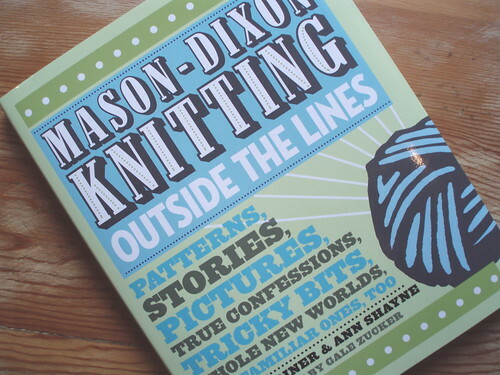 Like so many people I greatly enjoy the Mason-Dixon Knitting blog, and admire and envy the way that Kay Gardiner and Ann Shayne create images of lives where knitting is (usually happily) integrated with family, work, and other creative and artistic endeavours. Their books distill these images even further. They are fun and outrageous, while remaining practical and everyday. I was one of those children who always needed to colour 'inside the lines', a characteristic I've carried over to most of my adult craft activities, and now my knitting. I love ringing the variations within a defined shape, rather than colouring 'outside the lines'. The Mason-Dixon women and their books enable me to glimpse for a moment another kind of world that I have fantasies I'd like to inhabit, but never will. 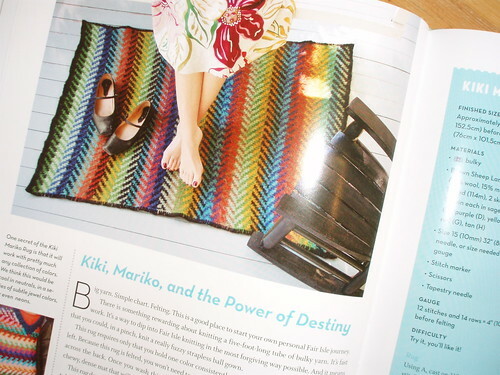 On reflection, apart from purchases where I've had a specific need for a particular pattern, most of my knitting book purchases have come from an escapist desire to be part - even for the odd half hour or so - of the life evoked by the projects and their settings. Elizabeth Zimmermann's books, with their practical energy I could never emulate, particularly affect me this way. But Outside the Lines also has some projects I'm very keen to attempt - showing they are practical as well enviable. I don't only want to aspire to the Mason-Dixon world, I want to bring a little bit (a manageable bit) of their world into mine. 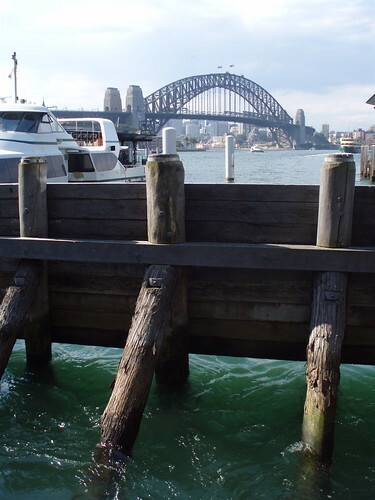 Sometimes Sydney is so beautiful that it becomes all the tourist literature cliches. 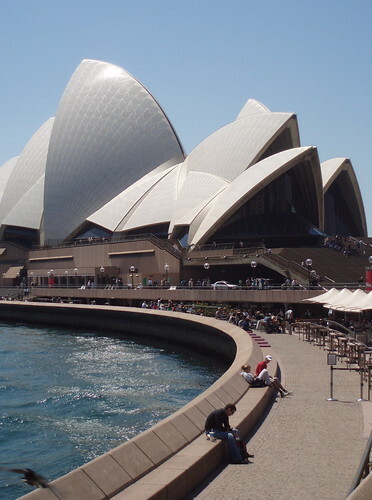 This afternoon - a sunny, warm Spring afternoon - I went to an opera at the Sydney Opera House. 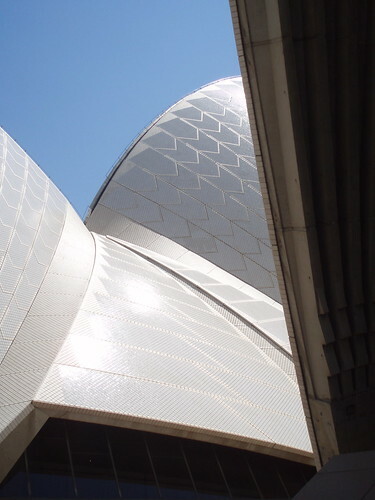 I caught the train, and the short walk from the station to the Opera House gradually revealed the Sydney icons. This short walk always causes a surge of delight when, going about my 'everyday' life, I can experience something so beautiful that other people travel to experience that same beauty. This delight never seems to wear off. I feel very privileged. And the opera was wonderful - a performance of Leos Janacek's 1926 opera, The Makropulos Secret . It was a revival of a production directed by Neil Armfield, one of the best (the best?) theatre directors in Australia. It opens in 1924 Prague in a lawyer's office that immediately calls to mind both Kafka and Dickens' Bleak House, but by the end the story anticipates something more like the magical realism of One Hundred Years of Solitude. Cheryl Barker in the central role of Emilia Marty / Elina Makropulos is compelling, suitably glamorous, strong, and ultimately tragic (though the opera has moments of comedy and might even be described as ironic). 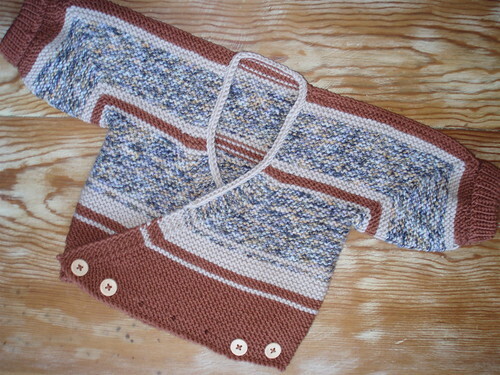 I've just finished knitting an EZ's Surplice Baby Jacket as a gift for a young friend who's recently had a baby boy - Alexander. It's such a natty design - the applied i-cord that neatly edges the neck opening; the so-practical adjustable buttoning at the waist where the button-holes continue around the bottom edge as a decorative feature; the ribbing added to the sleeves to cosy the jacket. But of course what I really love is the regularity of garter stitch, the boxiness of the shape and the way the stripes form such neat shapes. So satisfying. So much has now been said and written about Elizabeth Zimmermann. But I find it interesting that I've only recently discovered her, despite being an occasional knitter, and generally interested in fibre crafts through the 1960s and 70s. I suspect Elizabeth Zimmermann was not widely known because of the vagaries and restrictions of publishing and book exporting to Australia. It's only relatively recently that books and publications from the USA have been freely available in Australia, and of course the internet and on-line shopping have rapidly globalised knitting contacts and knowledge. 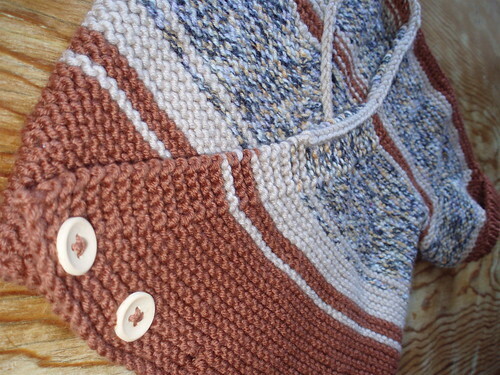 I bought my first Elizabeth Zimmermann book last year - The Opinionated Knitter - because I wanted to knit a Baby Surprise Jacket, my first excursion into Zimmermania. It's such an attractive book, and it's so appropriate that it is square. 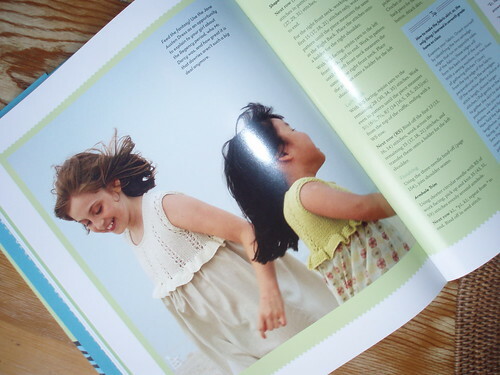 The seductively beautiful photographs feature members of EZ's family, which enhances the book's folksy charm and makes the patterns seem more possible and accessible. These characteristics are further developed by the reproduction of the obviously type-written Newsletters and sketched diagrams. I fell in love with the book, and was captivated by the EZ character. I would probably never make many of the garments or accessories. On the whole, I'm not interested in making or wearing traditional shetland jumpers or yoked fair-isle garments. I think what I most admire is the practical, 'let's make it happen' attitude that underpins all her work and writing. She's not pretentious, though she is opinionated, and I like that combination. 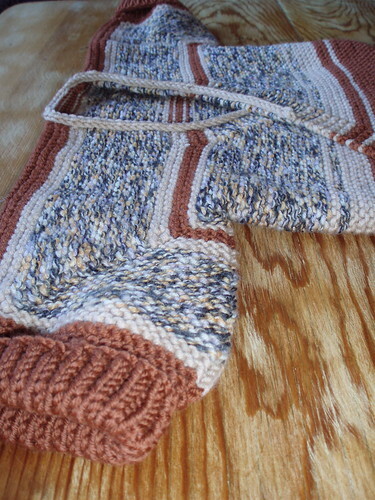 And of course I love her love of garter stitch and the way she exploits and features its mathematical precision. Having already made the Baby Surprise Jacket (twice) and a February Baby Sweater, it's been fun to add the Surplice to my EZ repertoire. 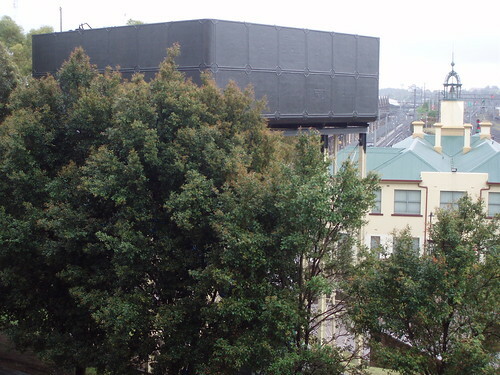 They've painted the watertower that's the view from my living room window - but they've (fortunately) painted it slate grey. The lemon cream colour that panicked me so much seems to have been an undercoat. The struts that support the watertower are still lemon cream, but I'm hopeful they also will eventually be grey. The beautifully textured rusted surface has gone, but maybe the new paint will protect the surface so I can continue to enjoy my view.